The order on my desk today is for rustic place cards for a California wedding. These are my favorite place cards right now which makes this order even more fun. 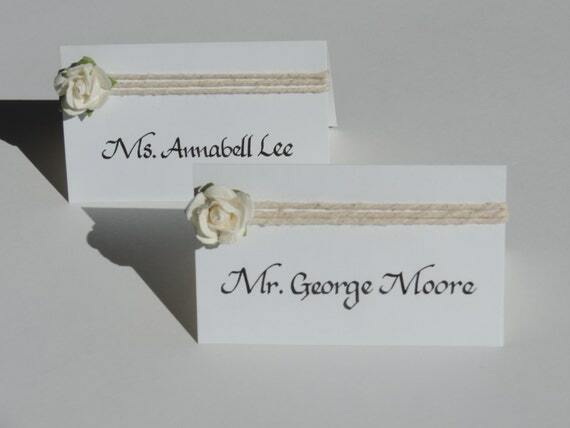 These ivory place cards are wrapped in twine and embellished with an elegant rose. If you're DIY-ing your wedding place cards you might be wondering where to start. Well, I hand letter the guest names only after the paper has been cut and scored. This way it's easier to find the best placement for the writting. Once the lettering is dry, I then add the finishing touches of ribbon, twine, etc. using hot glue or glue dots. Pro tip: flat place cards transport easier than folded place cards. For this order, the place cards will be hand lettered with my Rose Script, which is a traditional chancery style calligraphy. I love that the bride will be mounting the ivory colored place cards on wood stands. That will flow so beautifully! Once finished, they will look much like the above rustic place cards that were made using white card stock. I will be at the Divine Children's Show September 22-24th in Raleigh hosted at the Garden on Millbrook! I'll talk more about that along with a very awesome event giveaway, but I'll save that for a little later. Are any of y'all planning on shopping at the DCS event this Fall?